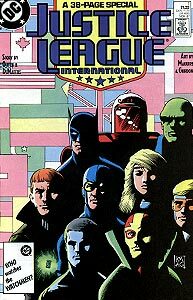 Cover Description: (Clockwise from center) Blue Beetle, Black Canary, Booster Gold, Mister Miracle, Captain Atom, Guy Gardner, Batman, Rocket Red, and Martian Manhunter stand against a background of international flags. Brief Synopsis: After polishing off the Gray Man, the Justice League finds itself manipulated by outside forces into a United Nations-sanctioned super-team. Issue Summary: In the Secret Sanctuary, Guy Gardner wakes up from his defeat at Batman's fist and begins searching for his discarded Power Ring. Seeing a mouse, he is startled into another concussion. After seeing that the Gray Man is properly "rewarded" by the Lords of Order, Doctor Fate restores the citizenry of Stone Ridge, Vermont. The Justice League regains consciousness, parts ways with the Creeper, and heads home. At the United Nations in New York, Martian Manhunter confronts Maxwell Lord about his plans to take the Justice League global. Manhunter is surprised to discover that Lord's "associate" is Mister Miracle's business manager, Oberon. Unknown to Manhunter, their conversation is watched remotely by a third party. Still concerned that Guy Gardner is a member of the new League, Hal Jordan confronts Gardner directly. Jordan is surprised that Gardner takes his criticism so well, and he warns Mister Miracle and Captain Marvel about Gardner's behavior before leaving. In order to circumvent "media hostility" against the new Justice League, the mysterious third-party launches an attack on Earth from a space satellite. The Justice League springs into action, taking a S.T.A.R. Labs space shuttle into orbit. When the satellite resists missiles, the League dons space suits and approaches. Batman has his space suit compromised, but realizes that the Justice League has been set up. Batman's hunch is confirmed by Mister Miracle who reveals the satellite to be of New Genesis origin. Issue Notes: As the Justice League accepts the approval of the United Nations, the title of the book changes from Justice League to Justice League International while maintaining it's previous numbering. This League also has its first major membership shake-up; out are Dr. Fate and Captain Marvel, in are Captain Atom and Rocket Red (as Justice League members #28 and #29). Batman steps down as team leader to be replaced by Martian Manhunter. This is also the first issue to spotlight the change in Guy Gardner's persona from aggressive troublemaker to agreeable pacifist. With Dr. Fate's resolution to the Gray Man's situation, Booster regains consciousness alongside the rest of the League. Booster stands with his fellow Justice Leaguers in conference with a specialist inside S.T.A.R. Labs. Whether this is the New York or Metropolis campus of S.T.A.R. Labs is unclear. A narrative balloon from the editor indicates that sound effects are provided by "artistic license." Of course, there is no sound in the vacuum of space, though why a comic book editor would suddenly feel the urge to justify the inclusion of space sound effects when other American entertainment media has long ignored the science altogether in favor of exploding asteroids and Death Stars is not entirely clear. As the Justice League battles a rogue satellite with a death ray, Booster brags about the capability of his force field. Booster will visit space occasionally, sometimes protected only by his force field, sometime requiring a suit. 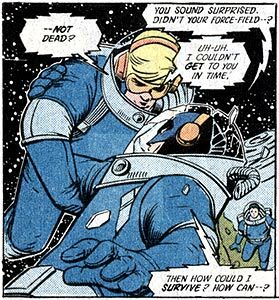 POWER DOWN: Batman assumes that his damaged space suit has been saved by Booster's Force Field and is surprised to discover that Booster has had nothing to do with Batman's life support. Booster and several other members of the League are in the United Nations 39-floor Secretariat Building in New York City. The Secretariat Building stands alongside the East River in the Manhattan. This is the first time that Booster has appeared on panel with Mister Miracle's right-hand-man and Justice League assitant, Oberon. With the Justice League now sponsored by the United Nations, Booster is gleefully introduced to the U.N. General Assembly alongside (from left to right) Martian Manhunter, Batman, Black Canary, Mister Miracle, Blue Beetle, Guy Gardner, Rocket Red #7 (Vladimir Mikoyan), Oberon, Captain Atom, and Maxwell Lord. Captain Atom (from the U.S.A.) and Rocket Red (from the U.S.S.R.) have been forced into the Justice League as representatives of their respective governments in order to earn the recommendation of the U.N. Security Council. The U.S.A. and U.S.S.R. have each always been among the five permanent members of the U.S. Security Council, and were almost always at odds during the decades-long Cold War. The other three governments with permanent seats on the Security Council, China, France, and Great Britain, apparently did not have any problems with the Justice League roster despite the League having no members from any of those nations. This is the first meeting between Booster and either Captain Atom or any Rocket Red. Effective immediately and after a run of only 3 issues, Booster is no longer the "New Guy" in the Justice League. Boosterrific Review: Enter the Justice League International. A lot of things are happening in this issue, and at times the story seems disjointed and unnecessarily confusing. Fortunately the simple and elegant art of Kevin Magurie and Al Gordon provide a beautiful unifying style for the issue's story, smoothing over any rough patches in Keith Giffen's pacing. While it is true that this series features more comedy than is seen in all of the previous Justice League series combined, this series is simultaneously more realistic in its approach to the concept of a league of super powered heroes than what has come before. Those facts make a refreshing change on all fronts, and make this series something special.